Maurice Wi lliams arrived in 1976 with his teenaged family to find a flourishing church with a membership of over 200 and no debts. The family soon made itself at home and, maybe coincidentally, the YPF (Young People's Fellowship) flourished. They had regular Sunday evening meetings and other activities such as walks, punting and holidays both in Britain and France. There were two services on a Sunday: the morning lively and busy with many families, the evening quieter and smaller. The monthly after-church coffee became fortnightly and, in 1984, the morning service moved to 10.30am and the coffee was weekly. There were worries that the church buildings were not being fully utilised. Prior to this the buildings had only been used for strictly church based activities. It was now decided to let them be used, one day a week, for a new 'club' for elderly people with psychiatric problems. This would provide the elderly members with interesting activities and their carers with a 'day off'. It was to be run by members of the local churches and so the Sycamore Club was born in September 1978. In 1980 there was another request to use the buildings, this time by a Speech Therapy group for stroke victims, the Woodside Clinic. The premises were not ideal for their needs but, for want of anywhere better, they too started to meet at the church. They met four days a week for the next six years until they eventually found somewhere more suitable. Other outside groups asked but many requests were denied because of impracticality; however PAGODA (a support group for families of drug addicts) and the Chiltern Christian Training Programme both started using the premises. A Men's Luncheon Club, as a complement to the various women's groups, was suggested by the minister and started meeting. Longtime church member, Kenneth Nunn, started two different outreach projects in the mid-1980s, both of which still exist. As a result of requests from our linked missionaries, he looked into refurbishing unwanted tools to send to third world countries. From this small acorn grew Workaid. He also started the monthly short afternoon service at The Croft, a local care-home for the elderly. Local ecumenism was still taking place under the auspices of the Interchurch Committee. There was a joint Good Friday Play was produced, a residential weekend and regular meetings of the six-church committee. In 1983 there were three joint services and housegroups were started once again during Lent. In 1984 a formal Declaration of Intent was drawn up for four of the churches. AFC, St Michael's & St John's all voted for the proposals. St Leonard's didn't and, as all four churches had to have a majority, the project fell through. The current Manse in Bachelors Way wasn't really big enough for a family of five and was without a study. The minister was using the Deacons' Vestry as his study which wasn't ideal. In 1984 the church received an offer from developers to buy the Manse to provide access to some new houses. Terms were agreed and, after a few hiccups, the sale went through. In May 1986 19 Cedar Grove was purchased ... a family sized house with a study. The choir was re-established in 1987 under the leadership of Sylvia Williams and Peter Townsend. A church orchestra, organised by Sylvia, contributed to festival services. The YPF, which had fallen by the wayside, was reopened by David and Sylvia Simpson. 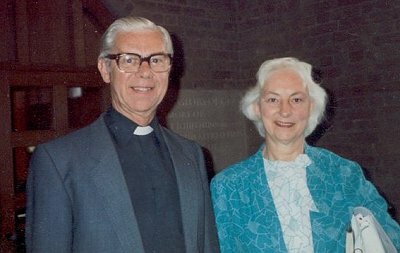 In 1988 a former member of the YPF, Graham Crawford, started to train for the ministry and, in September that same year, Maurice and Sylvia retired to the Lake District. A year later, Keith Riglin became the fifth minister of the church on his return from teaching in Jamaica.